Getting rid of head lice is a straightforward and simple process. The process can take a week or two as retreatment is often needed. However, the steps to take are not complex. The cornerstones of a lice treatment strategy are killing adult lice, which is fairly simple, and killing lice eggs, which takes some more work and time. There are endless natural and home remedies used to cure lice infestations however, many of them do not work and some of them actively interfere with other treatments. 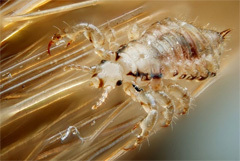 The safest and most efficient way to treat head lice is by diagnosing the infestation, finding everybody who has an active infestation, treating everyone who has head lice with a pediculicide (lice insecticide), removing dead and live nits (lice eggs) and lice with a nit comb, and retreating according to the type of insecticide used. All of these steps as well as preventative measures and supplemental methods are explained in full below. The easiest way to diagnose Pediculosis Capitis (see if you have lice) is by using a lice comb and a magnifying glass, both of which can be found easily in any pharmaceutical store. First, wash the person in question’s hair in water without shampoo or conditioner. Run the lice comb through their hair slowly from the base to the tips. Wipe the comb on a napkin and use the magnifying glass to examine the napkin and see if you find lice, nits (small white or yellow-brown dots), or small red bumps and sores caused by scratching. If you find lice on someone in your family, check everyone else in the house as well. Lice spread very easily and if even one adult louse makes it to somebody else’s head the whole family can get infested again. Once you have identified everyone that has lice, the lice treatment can begin. All infested people should be treated at the same time. You will need an over-the-counter pediculicide (lice insecticide) and your lice comb. Pediculicides generally come as a cream that contains one percent ‘permethrin’ as the active ingredient. ‘Nix’ is one of the most common brands of lice creams but there are plenty of generic brands that work just as well. Be sure to read the instructions carefully before using. Apply the cream according to the instructions. Twelve hours after applying the treatment, use a nit comb to check the person’s head. If the lice are dying or moving slowly, let the treatment keep working. If they seem unaffected, treat again. Make sure not to wash or condition hair before applying the conditioner or for two days after treatment. Washing with conditioner before the treatment stops the medicine from sticking to the hair and scalp and washing after treatment washes the medicine out. After treatment, check the person’s head ever two to three days with a nit comb for live lice and nits. Remove any dead or live lice and nits you find. Quite often one treatment is not enough and a second one is required seven to ten days later. Until you have completed the second treatment, make sure not to share hats, pillows, hoodies, combs, and so forth with the infested person. If after these treatments the lice seem completely unaffected or you find yourself saying “I’ve done everything you said but there are still lice!” then you may have lice that are resistant to the medication you are using. At this point, talk to a doctor about prescription medication and make sure to tell them what the active ingredient is in medication you used. Prescription medication is not necessarily more powerful, but uses different active ingredients, which the lice may not be resistant to. In extremely difficult cases, oral medication can be prescribed. Most people who are frustrated at a lack of results in treating lice even after having used pharmaceutical over-the-counter products simply have a resistant breed of lice. As head lice cannot live long off of a host, all that is truly required to get rid of lice can be found in the steps listed above. However, if you wish to be thorough, you can use the following non-pharmaceutical methods as well as the recommended treatment above. These measures on their own will not be enough to get rid of lice. Clothing, bed linen, towels, and so forth that were worn or used by the person with lice in the days preceding treatment can be washed and dried in a machine using hot water and hot air. Lice are killed when exposed to temperatures above 128 Fahrenheit for more than five minutes. Anything that cannot be washed in a machine can be sealed in a bag for two weeks. Lice will die without feeding for that long. Vacuuming the areas around where the infested person sleeps may help pick up nits and lice that have fallen off of them. Head lice cannot survive more than a couple days off of a host. Soak combs and brushes in near-boiling water after using them. At dBugger.org, we are fully supportive of cheap and easy natural and home remedies. We are not selling anything and gain nothing out from getting you to spend money on pharmaceutical treatments. That being said, with a lice infestation, you need to spend the money and get, at minimum, a pharmaceutical insecticide for lice and a nit comb. Very few natural ingredients have been actually proven to hold any water when it comes to dealing with head lice. Not only is there little proof of the efficacy of home remedies, but many can actively interfere with other treatments. Home cures such as vinegar, alcohol, mayonnaise, and swimming can wash commercial products out of hair and reduce the chances that they will work.